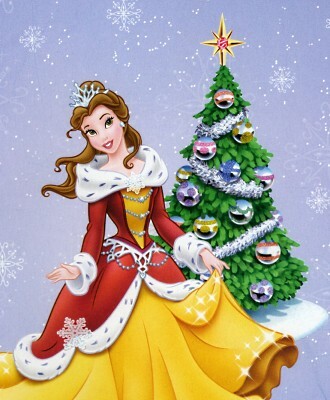 Joyeux Noel, from Princess Belle. "There are many things from which I might have derived good, by which I have not profited, I dare say," returned the nephew. "Christmas among the rest. But I am sure I have always thought of Christmas time, when it has come round — apart from the veneration due to its sacred name and origin, if anything belonging to it can be apart from that — as a good time; a kind, forgiving, charitable, pleasant time: the only time I know of, in the long calendar of the year, when men and women seem by one consent to open their shut-up hearts freely, and to think of people below them as if they really were fellow-passengers to the grave, and not another race of creatures bound on other journeys. And therefore, uncle, though it has never put a scrap of gold or silver in my pocket, I believe that it has done me good, and will do me good; and I say, God bless it!" For tropes related to Christmas. For More information on this holiday look on The Other Wiki page here. When you're tired of Christmas Carols and a simple "Bah Humbug" just won't cut it. Strange how a guy whose heart isn't two sizes too small can snafu the Holidays better than someone who is like that. We're Saving Christmas the old-fashioned way: with good ol' Lefty and Righty. A baby born on Christmas Eve in a stinky barn... are you sure he's not the Second Coming? You got tube socks while the Barbaric Bully got tens and twenties? There's only one reason. Rule #1 when your present is Chekhov's Gun — don't return it. Santa's favorite way to deliver toys personally. Their attempts to inspire Christmas cheer inspires some people to break out the Anti-Jehovah's Witness Cannon. Stores having Christmas sections well before December. Ah, that was a great episode! Why do they only air it one month a year? Christmas is so great, why can't we have it every single day of the year? Who says we can't combine some yuletide cheer with bikini season? It wasn't the Make-A-Wish-Foundation or the work of excellent doctors and nurses that made the Littlest Cancer Patient walk again — 'twas the magic of Christmas! note Actually, it wouldn't be Make-A-Wish or any similar organizations regardless, as they do not provide medical care or funding for such. What they actually do is provide a fun trip or activity to seriously (sometimes terminally) ill children, to provide some enrichment in their lives and/or make their last days/weeks/months/years meaningful. Just slap a "Some Assembly Required" sign next to the "Do Not Open Until Christmas" sign, it'll be fine! 'Tis the season for holidays-themed pop music. Stale TV Specials. Five months of bills! Black Friday hordes that would trample their own mother for a discount toaster. Asinine holiday music for three months solid, you know you're getting divorced as soon as the ball drops on New Year's Eve, and top it off with Dinner and a Show. It's the unhappiest time of the year. Did I Mention It's Christmas? Oh, right. Let's put up the tree, and then we'll get back to our Zany Schemes. For once a year, we put our differences aside, because we really want that Nintendo Switch. No heavy slush, just a perfect powdery blanket of fun! Along with the Homemade Sweater from Hell, this serves as a reminder that Christmas ain't perfect. Ah, Christmas, when Informed Judaism becomes just a little more informed. The moral of this story is: Being Twice Generous can be just as lame as being Twice Shy. I hope it's that vial of nitroglycerin I always wan--KABOOMABLAM ...Yyaayyy...! Merry Christmas, Now Buy the Merchandise! All the tropers in TV Tropes liked Christmas a lot... but the Troll who frequented 4chan did not! The Pimped Out Dressmaker has been waiting all year to debut this little number. Christmastime is all about giving, after all, which is why you Got Volunteered for our annual charity drive. The average Joe in Real Life can't wrap gifts like the elves can. It's itchy, it's tasteless, it's two or three sizes too big, and it's Christmas. Fiction has so many different answers. ...And realized the True Meaning of Christmas and gave it back before we had to beat the hell out of him. Suicide Prevention is the ultimate Christmas Miracle. A demon who specializes in Corporal Punishment; now, that's a Holiday tradition! And some vegetables and water for the reindeer; can't forget them! To all kids Dreaming of a White Christmas down south, anything's possible this time of year. Try not to let your whiskey-soaked beard fall off, will ya? For one time a year, the Crapsack World becomes kind of pleasant. Because who would want Santa to be single? Your Christmas cheer isn't great enough unless it can be seen from orbit. I guess Not Everyone Is Christian at Christmas, but hey, the Chinese restaurant is always open! There's an art to it, as any anxious kid in fictionland will tell you. Where it's unclear whether or not Santa exists. Santa Claus... if he were imagined by H. P. Lovecraft. Red suit, check. White beard, check. Large belly, check. Ho ho ho, check. Sack of toys... hopefully not filled with Furbys. Hey, isn't this some dude's birthday? I heard that He was a pretty cool guy. See? Santa Claus is real, just like the Easter Bunny and Stingy Jack! Saint Nick is in danger, and we gotta Recruit Teenagers with Attitude to set things right. A classic gift exchange system that leads to many an Unwanted Gift Plot. Because this time of year is no reason to forget the fanservice! Who says snowmen have to be inanimate? Who needs a compass when you're The Three Wise Men in Bible Times? Why would Santa Claus make The Cameo in Anime? Awesome, Dear Boy, that's why. We come bearing gold and a couple of smelly things. It's better to give than to receive, so give me a hundred dollars. Seasons Beatings on this Darker and Edgier Christmas! Wait a minute, that's holly. Ah, who cares when it's time for muchas smooches? This year, Christmas will be ours! There is a Santa Claus, because he's Always with You. In other words, no there isn't. Not getting any good cheer from The Scrooge? Send three ghosts to Scare 'em Straight!